Product prices and availability are accurate as of 2019-04-21 05:47:05 UTC and are subject to change. Any price and availability information displayed on http://www.amazon.com/ at the time of purchase will apply to the purchase of this product. 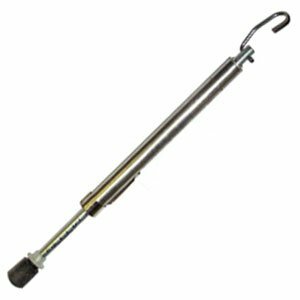 Range is from 0-35 Pounds Door Pressure Gauge Push-Pull instrument design specifically to measure force. 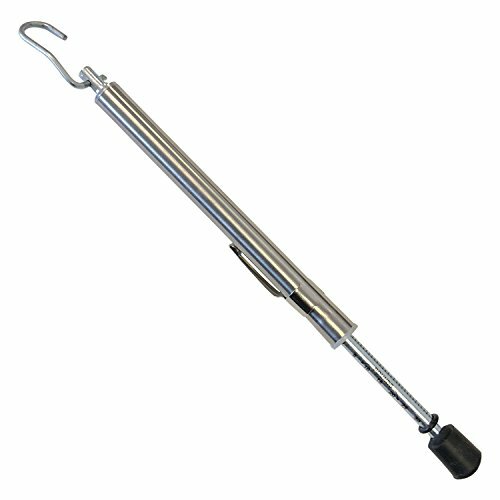 This instrument is capable of measuring the entire range of forces found in servicing interior and exterior doors. OPERATING INSTRUCTIONS Set the top (small) o-ring located on the plunger rod on zero, down against the instrument's flange; or set the o-ring on the desired force. Holding the instrument firmly, press slowly against the door at a point approximately handle-high, and 30 inches away from the door's hinges. Read the amount of force required to open the door on the plunger scale closest to the bottom of the small o-ring. MEET ADA REQUIREMENTS The Americans with Disabilities Act requires that both interior and exterior doors of a building be handicapped accessible. Door Opening Force (4.1311 ADA AG). Exterior hinged doors: (Reserved) Interior hinged doors: 5 lbs (22.2N) Sliding or folding doors: 5 lbs (22.2N) Automatic/Power Assisted Doors: (4.13.12) Such doors shall not open to back check faster than 3 seconds and shall require no more than 15 lbs (66.6N) to stop door movement. 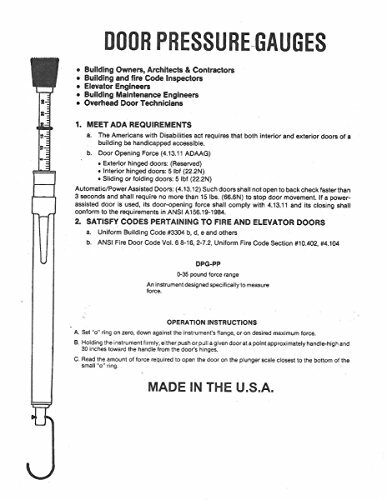 If a power assisted door is used, its door-opening force shall comply with 4.13.11 and its closing shall conform to the requirements in ANSI A156.19-1984.